Some seven decades ago, the Hotel Antumalal broke the mold of classic Chilean “Lakes District” hotels with a Bauhaus-style structure on a hill overlooking Lago Villarrica, on the western outskirts of Pucón. In the interim, it’s become a landmark that’s drawn famous clientele including Queen Elizabeth II, King Leopold of Belgium, Barry Goldwater and Jimmy Stewart (and me?). 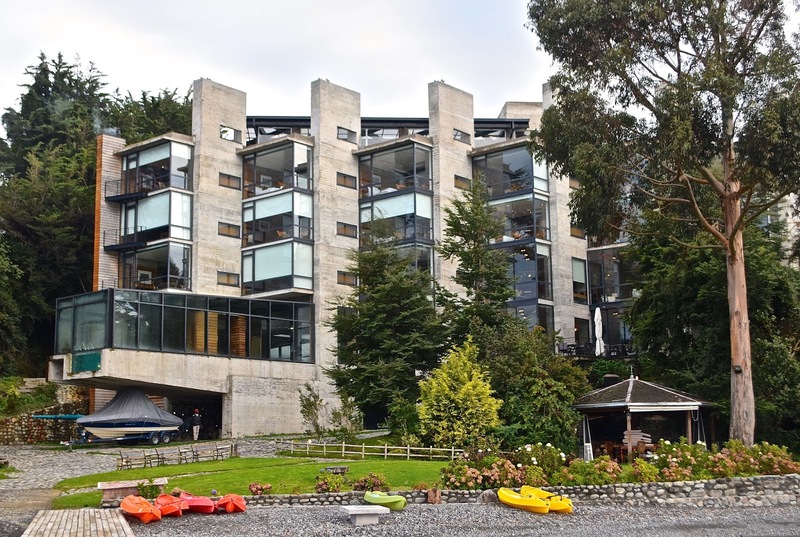 Pucón's Hotel Antumalal introduced Bauhaus-style architecture into Chile's lakes region. In fact, I’ve stayed several times at the Antumalal, most recently in March. 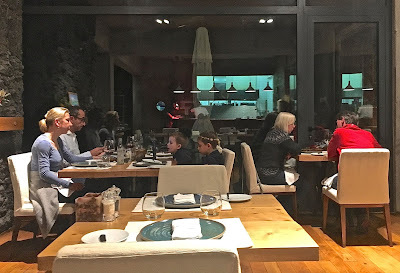 A few days later, though, I had the pleasure of spending two nights at the recently opened Hotel Awa, whose bold contemporary design comparably contrasts with the Mitteleuropa style of nearby Puerto Varas’s emblematic architecture. The Awa occupies a similar lakeside setting to the Antumalal, but its multi-story concrete, glass and girder exterior is more conspicuous—perhaps, in part, because the Antumalal’s had so many decades to cultivate its elaborate gardens. 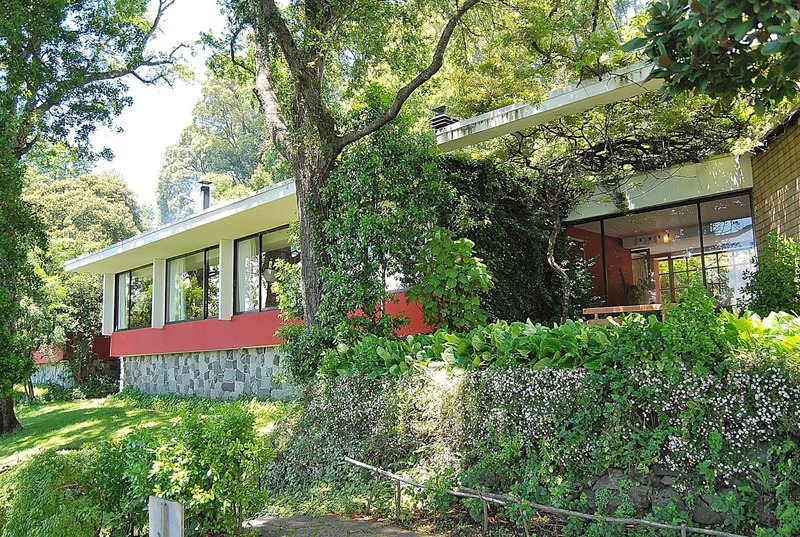 While the Awa’s exterior is imposing, its interior is cozy, with regional woods and other local decorative touches, but also large picture windows looking onto Lago Llanquihue. 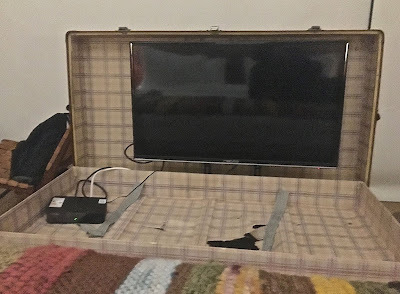 The rooms are also contemporary, with more electrical outlets than I’ve ever seen despite rustic touches that include hiding the flat-screen TV—accessed by opening the lid of a leather trunk. 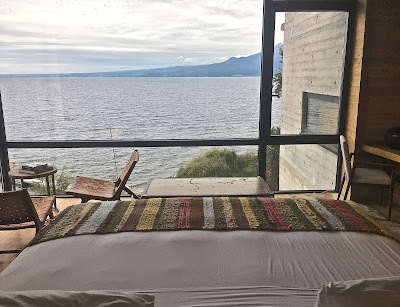 For me, the room’s most confusing aspect was the remote control that raised and lowered the curtains—I never quite got it right, and I recommended that the manager leave written instructions for using it. An old steamer trunk hides the flat-screen TV at the foot of the bed. While the Awa is happy to entertain overnight guests with bed and breakfast, it also offers excursions in the area and all-inclusive packages, including meals in its restaurant. 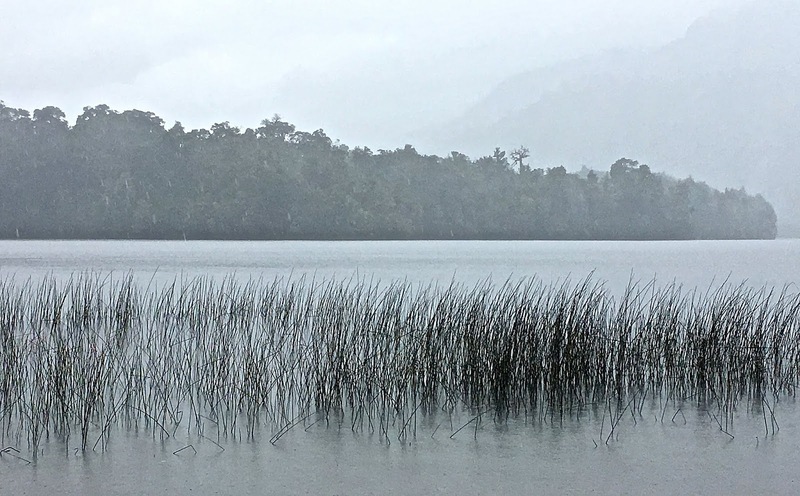 On my first full day, when it was pouring rain in a Marine West Coast climate that resembles the Pacific Northwest—“Awa” means water in Mapudungun—I took a guided hike to Laguna Cayutué, on the southern edge of Parque Nacional Vicente Pérez Rosales. 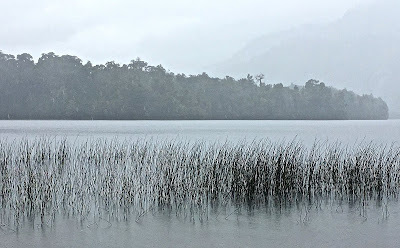 The trail, through dense Andean forest, often resembled a stream, so it took extra effort to avoid muddying boots and clothing and, at the end of the day, I returned soaked. The weather doesn't always cooperate with hikes in the area. 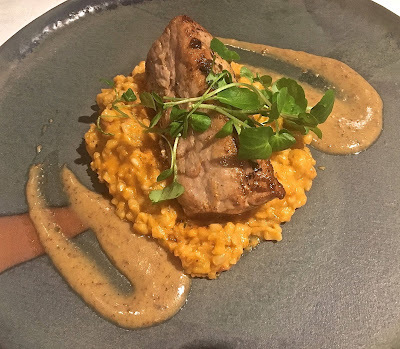 The truffled pork loin ended the day more than satisfactorily. So, I decided to take a soak in the spacious Jacuzzi before descending to the Awa’s restaurant for a truffled pork loin complemented by a barley-based risotto from its own vegetable garden and garnished with a hazelnut sauce. And, of course, there were a pisco sour and a glass of Carménère to accompany the main course, before a white and dark chocolate parfait. The next morning, I awoke to clearer weather with views across Lago Llanquihue—after I somehow managed to raise the curtains. Late last year, I briefly noted the publication of Sarah Kaminsky’s Adolfo Kaminsky, A Forger’s Life, the tale of her father’s service in the French Resistance of World War II. That interested me, partly because Kaminsky is an Argentine, and partly because the Resistance provided forged identification that helped my 94-year-old uncle, who lives in Los Angeles, escape the Nazis after being shot down over France in November of 1943. His own account of traveling across France and into Switzerland is positively cinematic. 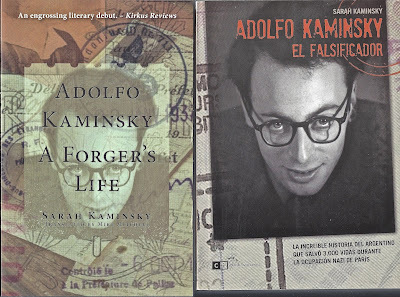 I received a copy of Kaminsky’s book from the US publisher but, on my recent trip to Buenos Aires, I purchased a copy of the Spanish-language edition Adolfo Kaminsky El Falsificador, primarily because it includes a prologue about Kaminsky’s boyhood in the Argentine capital. 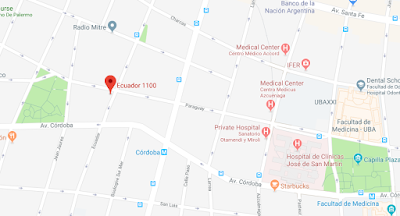 Though he spent only five years there before his parents returned to Europe, he offers surprisingly vivid memories of a free-range boyhood in an immigrant neighborhood that sounds like the edge of Barrio Norte (he mentions living on Calle Ecuador, apparently near Avenida Córdoba, but is not more specific than that). The intersection of Ecuador and Paraguay is roughly where the Kaminskys lived in Buenos Aires. Kaminsky’s mother, born in Tbilisi, married his Russian-born father in Paris during World War I. Given the disorder in Europe, heightened by the Bolshevik Revolution, the family had moved to Buenos Aires, where Adolfo was born in 1925. 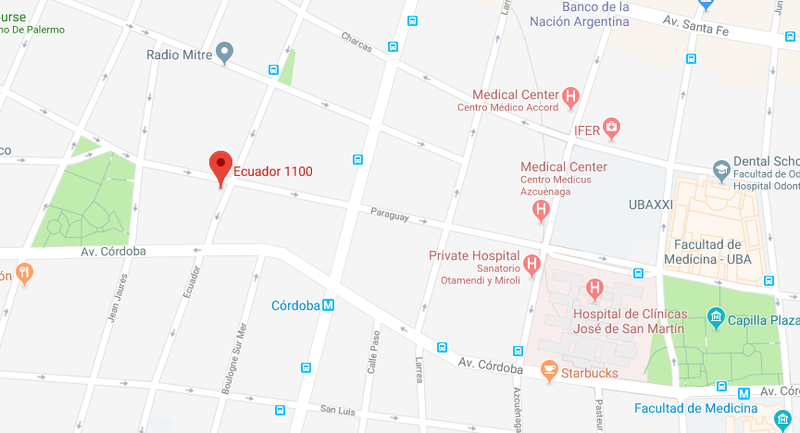 Interestingly, when the family returned to France, what struck him was the contrast with Buenos Aires, the noise from the cars, trams and trucks that crowded Parisian streets—“It was so different from Calle Ecuador!” In the ensuing century, Buenos Aires has more than caught up. Only 14 when World War II broke out, Kaminsky (and his Jewish family) survived the earliest years of the German occupation because of their nationality—Argentina remained a neutral country until nearly the end of the conflict. Adolfo, meanwhile, had acquired skills in printing, dyeing and photography that allowed him to produce passports and other papers that saved as many as 3,000 Jews from the Nazis. Eventually, the Kaminskys themselves had to scatter and hide—with the help of Adolfo’s bogus documents—but after the liberation of Paris he provided Allied forces with new forgeries that helped them infiltrate German lines. After the war, he assisted European Jews in reaching Palestine—though he deplored Zionism—and then helped figures in the Algerian independence movement move between North Africa and Europe. He prided himself in never charging for his services—everything was pro bono for causes that he either supported or saw as a better alternative to the status quo. Kaminsky did his last forgery in 1971 and lived in Algeria for a decade, marrying a Tuareg woman, before finally returning to France in the early 1990s. His daughter’s persistent inquiry into her father’s murky history eventually resulted in this book, presented as a memoir from a hero who, accustomed to staying in the background, refrained from boastfulness.